The Harris County Law Library relocated to the first floor of Congress Plaza on January 1, 2013. The report published here records the progress made in service to the citizens of Harris County, Texas in the last five years, from doubling traffic through outreach and increasing use of digital resources by more than 400% to building a robust public education program and strengthening ties in the community. On this page, you can read the report, download a copy in PDF format, and scroll down to read highlights from the Law Library's 5 years of progress. Our Office is pleased to report on the progress of the Harris County Law Library over the last five years. Since Commissioners Court approved our plan to make the Law Library part of our Office, we have worked to ensure it is a destination for all residents of Harris County who want to find and read the law that governs them and participate in their government. Building on the successes of recent years, our Office will continue the work of connecting the people with their legal resources at the Harris County Law Library. Jane is a busy solo attorney whose mobile practice keeps overhead low, but she occasionally needs resources outside her database plan and would like training on the newest research tools. 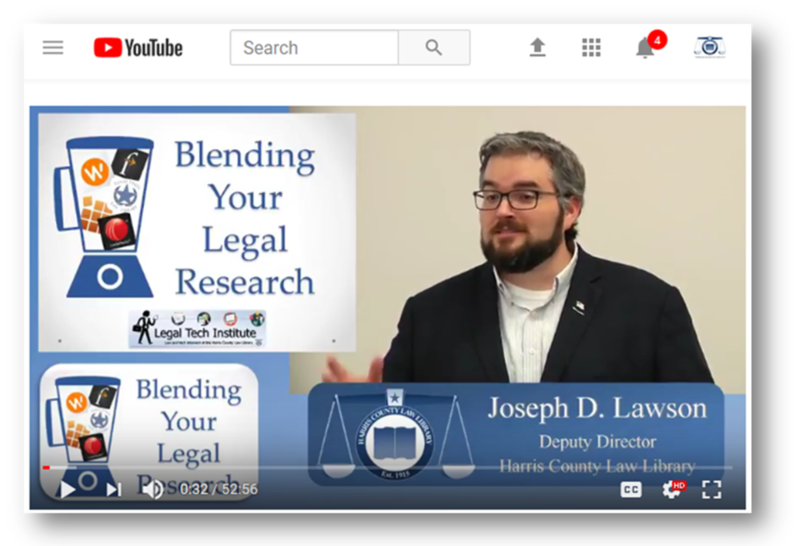 With free access to Westlaw, Lexis Advance, O’Connor’s Online, free WiFi, and free CLE, Jane can find the resources she needs to represent her clients at the Harris County Law Library. John is an entrepreneur who is building his company. Like many small-business owners, John’s fluctuating cash flow prevents him from keeping an attorney on retainer, but he knows he needs legal information. John can visit the Harris County Law Library where friendly law librarians can help him find self-help resources and connect him with community resources and attorney referral services when he needs legal advice. Increasing value for the citizens of Harris County is our #1 goal. From 2009 to 2016, we cut our cost per patron by more than half by doubling traffic through relocation and outreach while keeping costs low! The dramatic increase in traffic is also reflected in the increased demand for our reference services. The Law Library is a statewide leader in providing access to digital legal research resources, such as Westlaw, Lexis Advance, O'Connor's Online, and more. Between 2006 and 2016, we dramatically increased digital collection usage by expanding collections, offering training, and improving user experience. We support legal research and technology education across the Houston metro area by offering reference assistance, in person continuing legal education seminars, on-demand video training, library tours for student and community groups, and producing in-house and digital educational exhibits. Harris County, Texas sees more self-represented civil filings than any other Texas county by far. It is no surprise that 90% of Law Library visitors are self-represented litigants. We place a high priority on making legal information accessible and partner with Houston Volunteer Lawyers to offer an information booth 5 days a week and legal clinics. The Harris County Law Library has been a part of the local legal community for over 100 years. We continually work to strengthen those ties and to reach the greater community of Harris County, statewide, and beyond by speaking with bar associations and community groups. We also shine a spotlight on the good works of our local bar association, such as the Houston Bar Association's Pro Bono for Veterans program. The Harris County Law Library is a nationally recognized leader in providing legal information services to the public. The American Association of Law Libraries has honored the Law Library and individual staff members several times in the last five years for leadership and outreach efforts. In 2016, the government section of AALL named Harris County Attorney Vince Ryan the Law Library Advocate of the Year.